P5: From the horn belay I down climbed 15’ to a ledge. Slowly and meticulously I moved climber’s right and headed out into a 40’ airy traverse and finally clipped an old school rusty hanger. From here I had 2 options, get into a rated R chimney on the right and ascend the 20’ up until the first piece of pro, or take the rated R face directly above me and ascend to that same place. I chose the face. I explored the small nubbins with my hands, I chalked up as I planned my line. I started up on the small foot holds and was instantly searching for the next small rock nub that I could use for a hand or a foot. I slowly moved out left before finding a decent line that went back right towards slab paradise. I climbed slowly and very carefully, a fall here would certainly be a huge whipper on a questionable old school anchor. Rock nub after rock nub I moved up and right until finally the angle relaxed and the slab climbing began. Used the dished face until I finally straddled the R rated chute that dropped into nowhere. I slung a large column and finally clipped in, feeling a little more relaxed as I did. I mantled over the chimney chute to nowhere onto a large ledge. I walked around a large boulder and climbed up until I found the base of P6 and set a bomber anchor for Kari. “Climb On!” I yelled down. Following the lead with essentially 2 pieces of protection in 80’ is not fun, especially when you could swing out and seriously get hurt. So the pressure of following was not as relaxed as one may think. I couldn’t see Kari at all as I belayed. All I could is reel the rope in as he climbed. I listened for any noise in the wind and finally it came as he mantled over onto the ledge: “Woop!” letting me know he made it past the chimney. Soon he joined me w a big hi-5 and an exhausted smile. We were both tired, but still had 1 more pitch left. P6: I regathered the gear and grabbed the #4 Kari had been hauling up the whole time. I held onto a 0.75 Camelot (was so happy I had this later) and doubles from #1’s to #4’s. I once again started up, pulling a small roof before finding the off width pitch everyone boasted about. The corner facing wall to my left was blank and featureless and the bulge to my right was smooth and round. Nothing but the crack in front of me and smearing feat were there to aid my ascent. I worked at it, inch by inch, using the back of the crack with hand jams and used my gear as efficient as I could as I climbed. Once or twice I reclaimed a piece from below that I could use again higher up after placing. This pitch was the toughest and most painful! I fought for it, inch by inch, grunting, groaning through the pain. The flared wide crack finally started thinning up and I was so glad to have my 0.75 as it was perfect for the cracks exit. I placed my piece, took a rest, and finally reaching high and left for a really nice rail on the left wall. I knew I had it from there, even though the climbing wasn’t done. I kept fighting, up and on until Zoro finally seemed to give up a little. The pitch angle relaxed, my heart was thumping and the adrenaline was pumping through my veins. I kept fighting, and finally after 6 pitches of grueling technical climbing I topped out and slung a juniper pine at the top of the chossey exit. I set the belay and yelled down to Kari “Climb on!” Soon, after grunting and groaning, pulling hard for it, I saw Kari’s orange and red helmet come into view. I was overwhelmed with what we just did. I slapped his helmet, and the two of us, tired and ready to finish stood on the plateau just below the summit, knowing the technical climbing was done. The Summit Plateau: We stood, beaten and bruised, looking towards the setting sun and the huge summit block that stood in front of us. We dropped our gear and brought just a pack as we walked in our climbing shoes towards the summit. The earth here was fresh and virtually untouched, we did surprisingly find a few footprints. As we neared the summit, the block just continued to grow and we started to wonder if we should have brought gear. We skirted south west of the block poking for weak spots until finally we found a route that went up. We scrambled the C4 route up a chimney crack up the sharp rock until finally we popped out into a large open plateau. The top was huge! We walked towards the south end and found a large cairn with a summit registry hidden below. 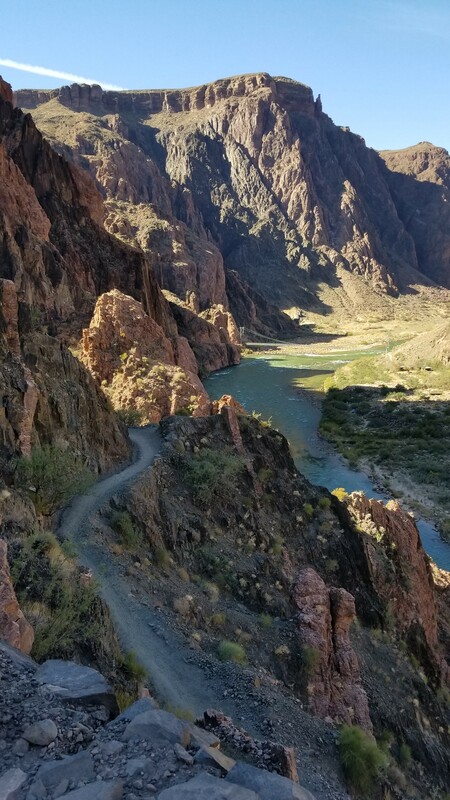 The views were incredible, we could see the whole of the south rim and a lot of the Colorado River from here. 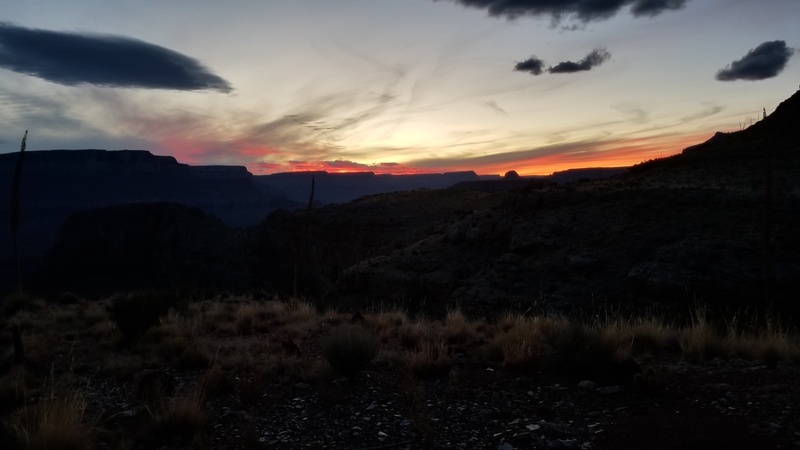 We peered back to the approach we ascended, throughout the day and stood in pure amazement of the Grand Canyon’s beauty. The closer we come the larger it grows! Finding the summit block's weakness and heading for the top! We wrote our names in the book, so stoked to finally be standing on top after dreaming of this moment for so long. Kari claimed first Icelandic ascent, and it was nice to thinking that the only way to the top was real climbing. The sights, the air, the feeling, the thrill, made every step worth it. 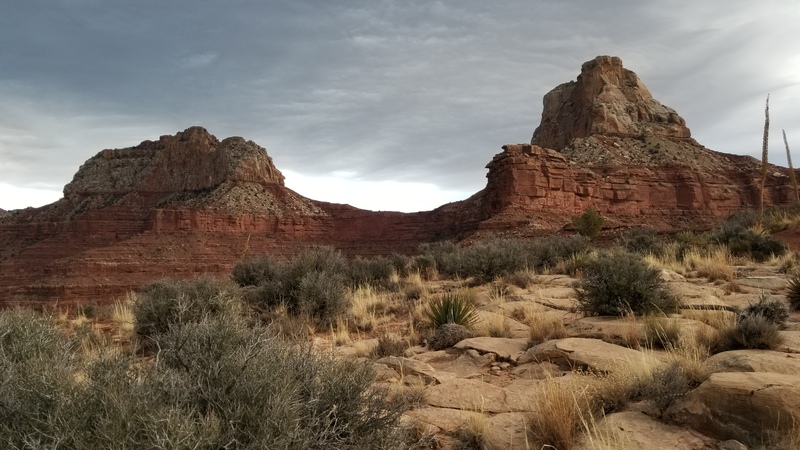 We turned knowing our time was limited as the sun threatened to leave us, and walked towards the north end to find the rappel route down to the base where we started. Rap Route: The chains were at the top out just to the climber’s right of screaming sky crack, a 5.11 trad route to the climbers left of the NE Arete. R1: The first rap was a nice 100’ long free hanging which ended in another set of nice shiny bolts. We stopped at each station, replacing the webbing for the rap rings so fresh stuff could be used by the next climbers. Coming down Rap1, looking left to Screaming Sky Crack 5.11! 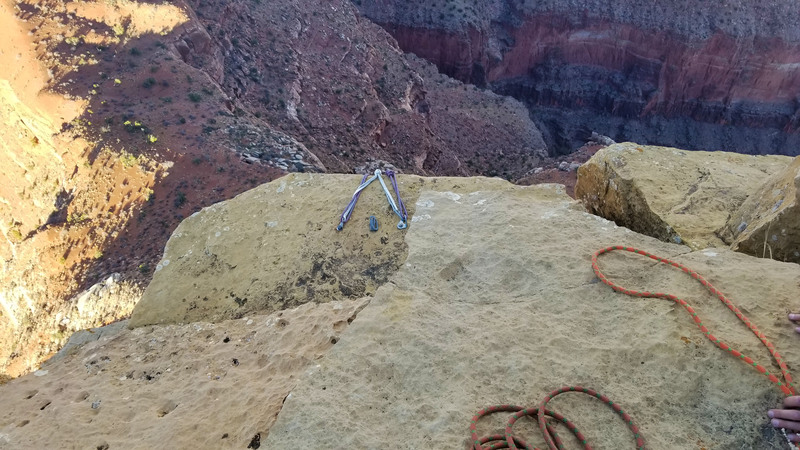 R2: A 60’ rap towards climbers left lead to a ledge with a nice tree and a couple more bolts, ready for fresh webbing on the rap ring awaited. 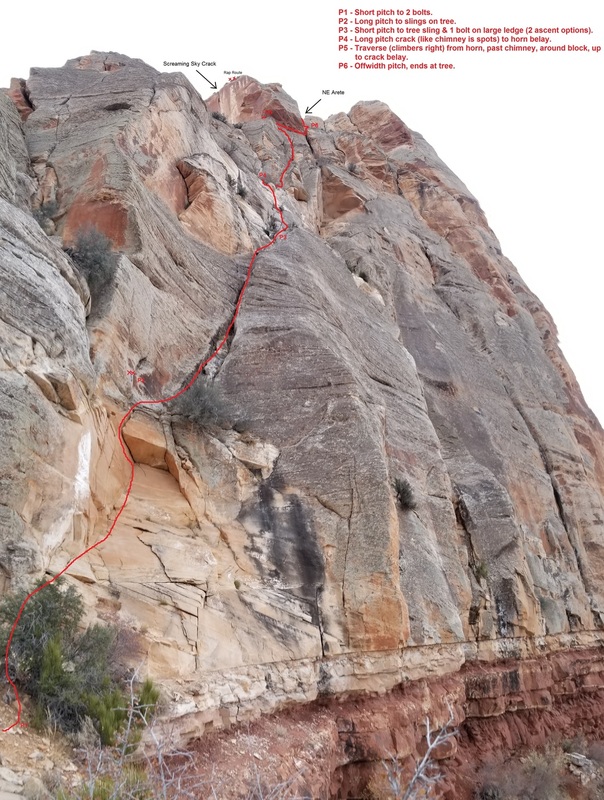 R3: A pretty straight forward 100’ rap down the face led to a large ledge. 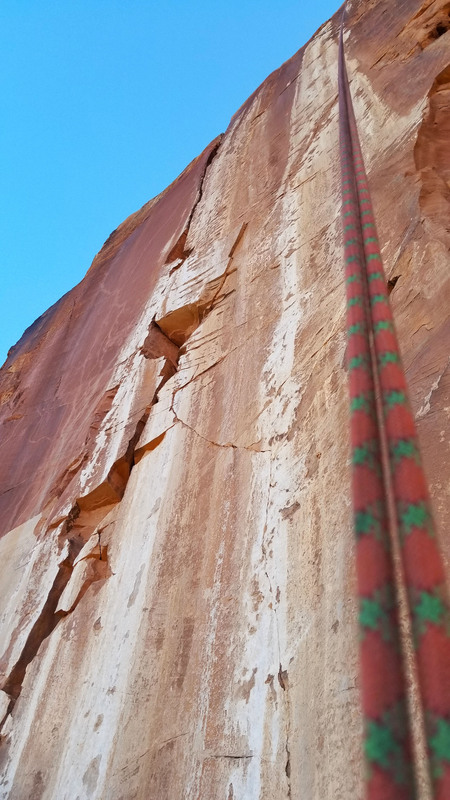 We worked to climbers left dropping another 10’ to another set of shiny bolts. R4: By this point we were pretty quick about replacing webbing, setting up and rapping down, I would keep my hand on the rope until I felt Kari’s tension release, then I’d start setting up. This time was no different I stood there waiting, hand on the rope, when all the sudden I felt a jerk of the rope and instantaneous slack on the rope. I though What the hell just happened, and I called down to Kari with no answer! There was only 1 way to find out and I set up the rap and had an ascender prussic ready in case I had to re-ascend the rope. I began rapping down, and finally about 60’ down the face Kari’s helmet came into view. “Kari!” I yelled. He answered back saying everything was fine and just come down slowly. 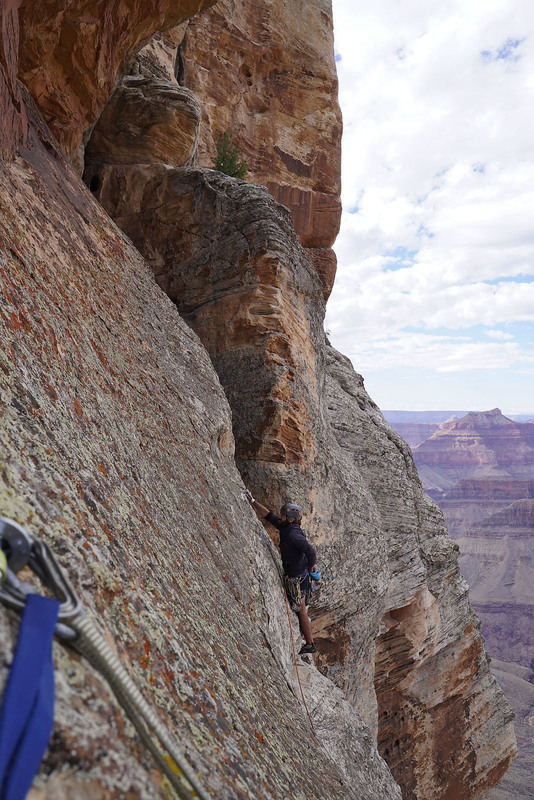 Once I reached him I realized I was at the end of the 70m rope, but I was still dangling about 8’ above the ledge. I held onto the rock in front of my face, untied 1 knot out of the end of the rope, and repelled off the end of 1 side of the rope, and safely landed on the ledge. “Whewww!” I exclaimed, happy to be on the ground. Do not try this at home! I did see a set of bolts half way down the rap route that we could have used, but this turned out okay. R5: We found ourselves at the bolts at the top of P1 and relieved there was just a short 50’ rap left as the sun gave off its final rays of light for the day. We were finally back on the ground, realizing we were on rock for a good 8 hours, between the climb, the summit block scramble, and rappelling with replacing all the webbing as we went. Tired, beaten, but happy to have accomplished out goal, we headed back towards camp the way we came. We hiked through the night reversing every obstacle we ascended, rapping where it seemed logical until reaching camp. We were both beat as we packed up camp and headed back down the red wall, how do people do this in under 24 hours?! Zoro, still staring us down in the moonlight! Kari, heading down the slot! Towards the cliff bands! We descended Sumner Wash and finally found feet back on Clear Creek trail. With our slightly lighter packs we headed back towards Phantom Ranch totally beat. We reached the ranch overlook at about 1am and both looked at each other knowing there was so much more trail before we exited via Bright Angel . . . “let’s have a quick nap”, I said. We pulled out a tarp and our sleeping bags and laid in a pullout of the trail and crashed until 5am. A ringtail visited us in the night attempting to “borrow” a few snacks, probing our bags for weakness. I heard some stirring, woke up and scared the little fella off. 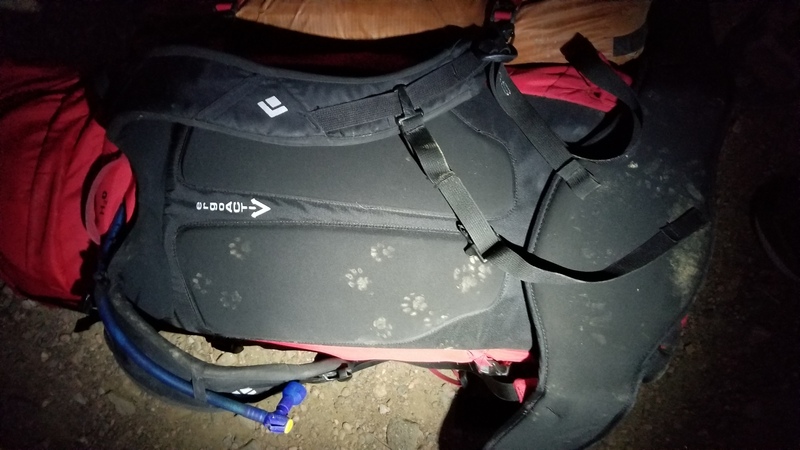 By the next morning our packs were covered with his prints. 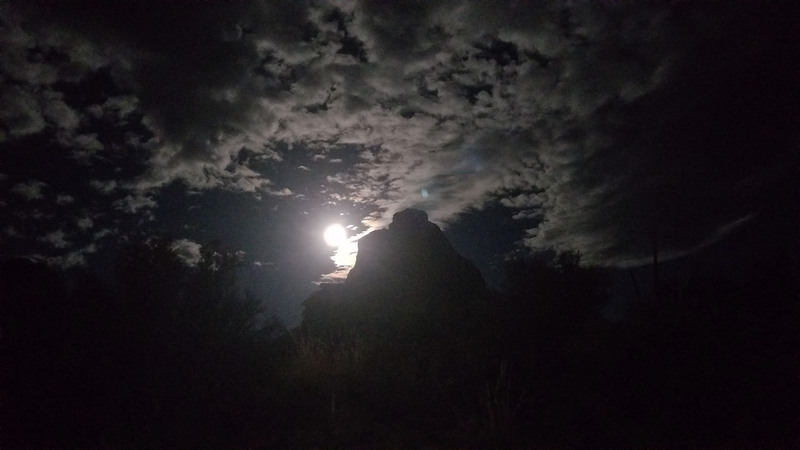 We woke, and packed our bags once again and were soon descending into Phantom Ranch. We took a quick pause to re-up on our almost depleted water supply. We snacked up, watered up, and chatted with other trekkers at the ranch with big smiles on our faces. 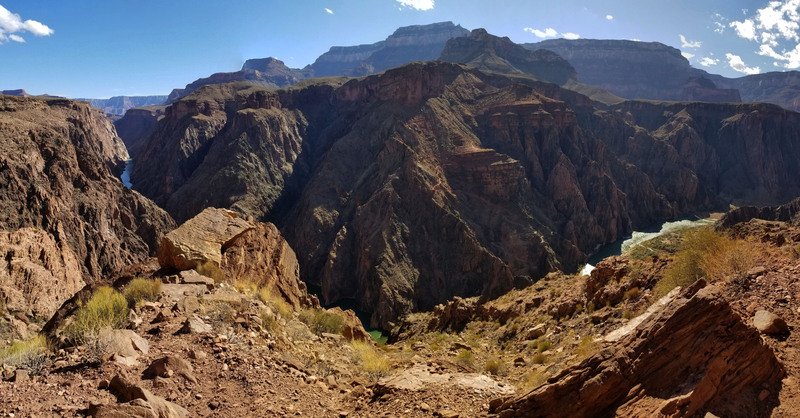 It was only about 9 more miles out via Bright Angel trail. We walked those miles feeling pretty light despite our load. We had somehow accomplished the goal we set out to achieve. 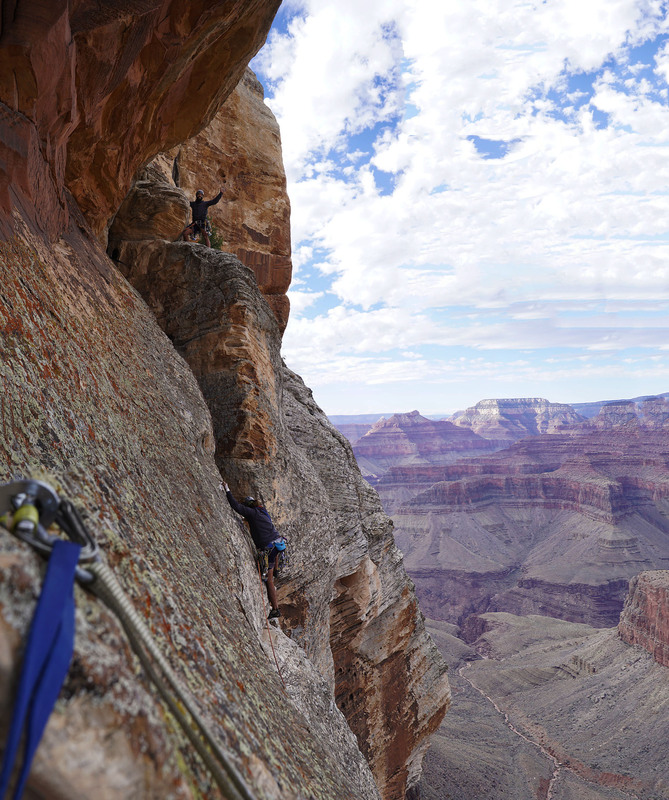 The entire day before seemed like a dream as we ascended to the south rim. We glanced back when we could, thinking about the day before and how rare of a chance we had to stand among the few who have summited. What a great feeling, another awesome trek in the Grandest of Canyons! Looking back towards Zoro, how gorgeous! The corkscrew, beloved in my mind! Almost out, how gorgeous his place is! Almost back to the Colorado! Time to push out the last leg! The final bridge before the exit! The wind screamed by our tent most of the night, waking us every 15 minutes it seemed. Finally, after midnight, I remember it dying down and getting some solid sleep. The alarm blasted, Bzzzz Bzzz Bzz, man was it time to get up already?! We woke, staying still for a moment checking the time. Sure enough, it was time to start our haul to the base of Zoroaster and hopefully attempt our bid on the summit. 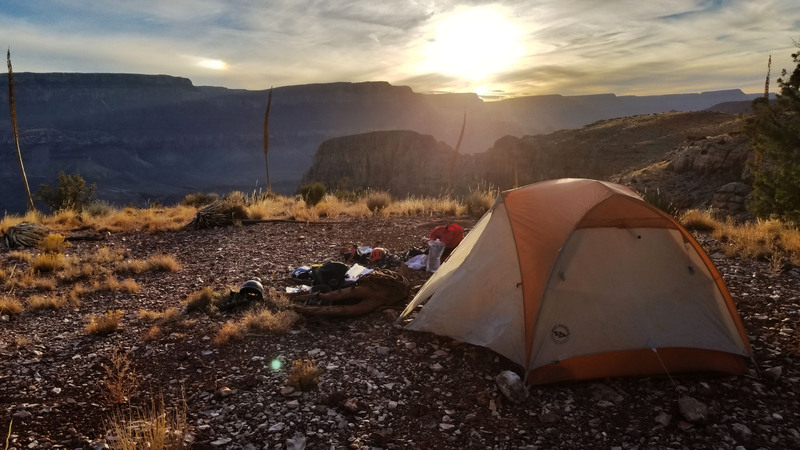 We ate breakfast, packed up camp, and before we knew it, Kari and I were taking our first steps towards the monstrous beast that loomed over our camp just as day began to break. Feet in red dirt we ascended Zoroaster’s arm, chimneying up a small obstacle and soon the next cliff bands stared us in the face. We picked our way through, shimmying up some low class 5 (C5) chimneys, handing packs as we ascended. We moved as quickly and safely as we could. A slip or mistake here would not only cost an injury, but also the goal, and not to mention the excruciatingly long rescue effort. Cliff band after cliff band we somehow found our way through. We pushed further up the arm, and finally after a long slot ascent and a large boulder shuffle, we skirted to the north and headed towards the saddle of Zoroaster and Brahma temples. 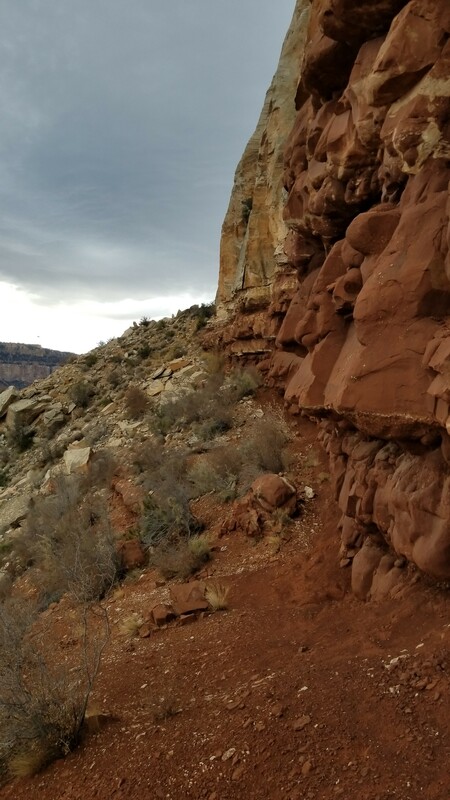 The footpath grew very narrow, vertical rockface to the right, and sloped dirt leading to a 400 foot drop to the left . . . better keep our heads on in this section! We carefully picked our way through following the footpath, cairn after cairn guided our way. Finally we found the weak spot in the headwall and started to ascend. The first obstacle was a chill class 3 scramble up to a ledge where we found a fixed rope for the next obstacle. We bat-manned up and sere soon past the next C4/C5 section. We followed the cairns as we went, across another rope less climb, up a slab, and finally to the spiciest of the obstacles. It was a good 20’ C5 climb with a fixed rope to guide us up! “How nice of someone!” I thought as we exited the obstacle. Obstacle 3 - Spicy fun! We kept pushing our way up the steep faint trail, following cairns until finally we were face to face with the sheer walls of Zoroaster. None of the faces we could see looked like our climb, so we continued to skirt east across the north face of Zoro. Walking on and on, when all of the sudden we turned right at the arête and stared at the 5.9+ NE Arete route. It was time to go to work! We racked up and Kari put me on belay as I stepped towards the start of the climb. Pitch 1 (P1): My hands were sweaty as I made my first step towards the start. I plunged them into my chalk bag shaking off the jitters and stared at a large triangle roof a good 25’ up a face. I started up the sandy sandstone face reaching the clearly clean roof. I threw a #3 Camelot on the crack and inspected the face wondering how I would pull the first obstacle. I reached high, and using a nice foothold on the left face I pulled myself over the roof and was soon clipping chains just 50’ off the ground. P2: The crack went up and climbers right from here and I followed. There were some fun moves, I stepped up, finding the next hold, repositioning and finding good gear placement. The long pitch meandered up right through the crack around some small trees. Move after move I ascended, sometimes being pushing onto some short slab climbs until finally I reached a tree covered in slings signifying the end of P2. Whew, made it! I threw Kari on belay and he soon followed. Trying to move quickly we spared no time exchanging gear and I set off again! 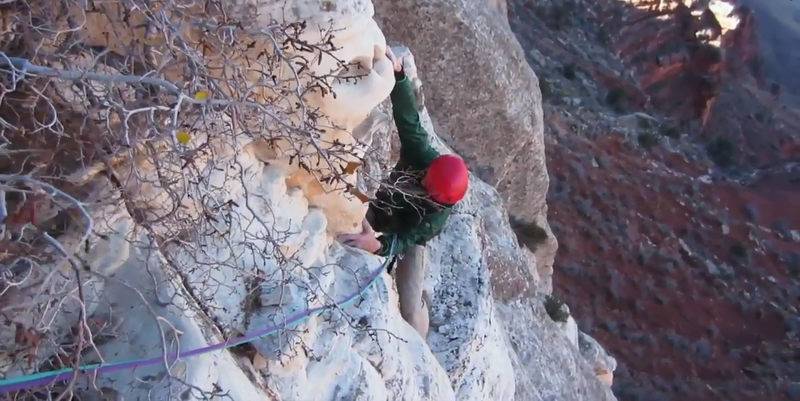 P3: The infamous “Crux Pitch”. 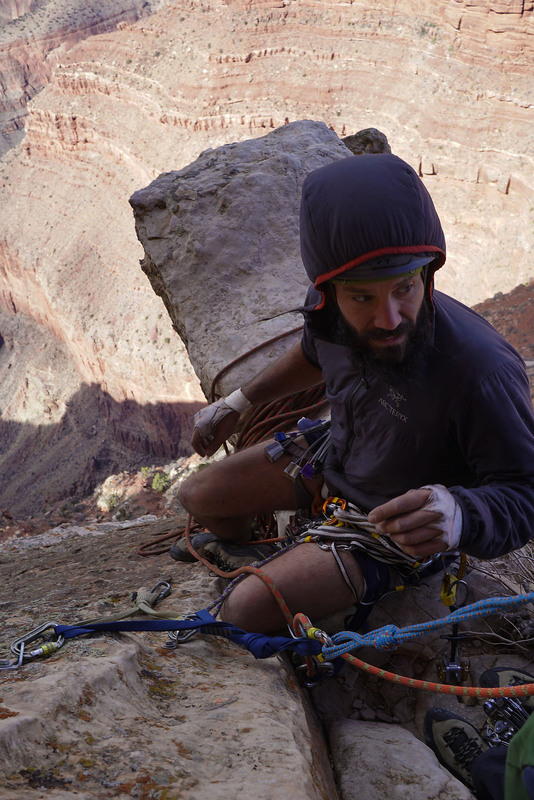 I move up and climbers right towards a fresh rock scar where a pinnacle used to hold on, creating a chimney for the next pitch (it fell in 2004). 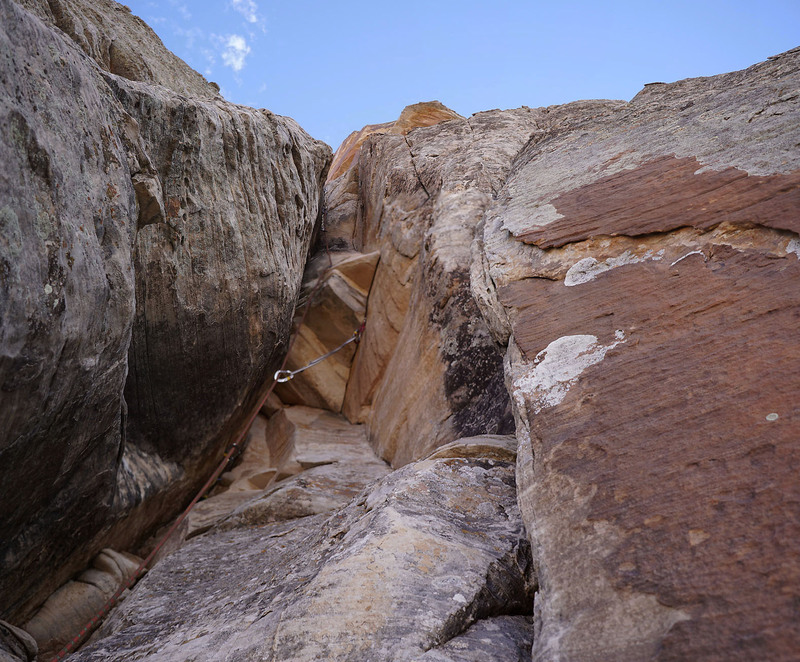 There were now 2 options for this pitch: ascend a section of runout slab face climbing with no protection, or a vertical sandstone slopper hold climb. 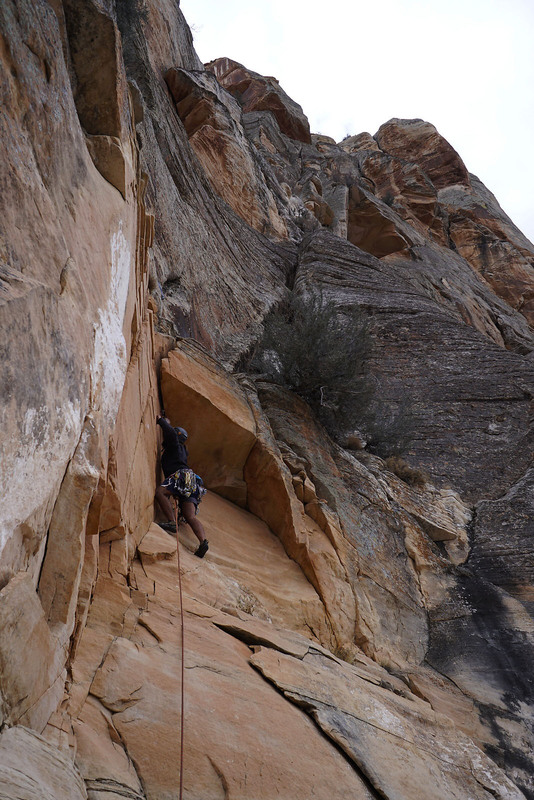 I chose the sandstone, heading almost vertical and slightly climbers left from the tree below. I placed a Camelot #3 deep in a hole/crack with soft sandstone edges and prayed it would hold. I moved up and left, finding a good left foot, dropped knee, intermediate sloper with my left hand, pinching a sandy sandstone shelf with my right hand . . . needless to say it was awkward . . . all of the sudden I was out of position. “Falling!” I yelled down to Kari as I blew off the face! Gravity took over and I fell for a good 20’ whipper before my #3 dug in and held me. Whew!!!! I thought to myself and let out a loud happy yelp “Wooooooo!” I grabbed my composure . . . this climb could end here. I stood back up and headed back for the same move. “Falling!! !” Boop, once again I was thrown from the face, the # 3 held, my hero!!!! I dusted myself off and looked upwards woundering if this was the end for us. I got back into the same position a 3rd time, only this attempt I threw my right hand up, blind, above the huge sloped rock in my face. To my surprise a bomber hourglass shaped hold!! I grabbed in and rejoiced as I made my next move to climbers left and safety of the next anchor. Sweat dripped from my body and I put Kari on belay. P4: I stood on a huge ledge and soon Kari joined me after enjoying the same interesting crux as I. 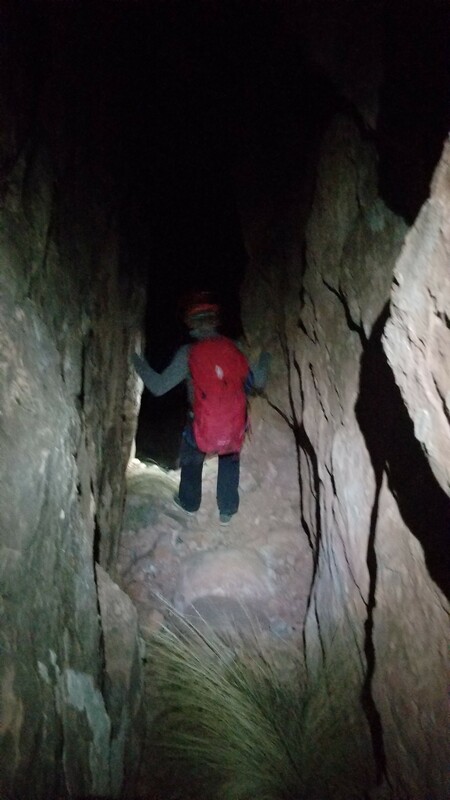 We had no time to waste, so I geared up and headed to a crack that was just above the fresh rockscar that moved climber’s right. I continued up this chimney running it out a bit, placing gear only where I had a nice stance. Even with all the runout, I started running low on gear! I found a small tree and looked up past the next chimney and there was still about 30’ above to the infamous horn belay. I decided to just build an anchor here and belay Kari up, breaking this pitch into 2. After some “fun” chimney Kari appeared at the belay, looking a bit tired and ready to be on the horn. I collected the gear he cleaned and headed up the final section of chimney towards the horn. I popped out of the chimney only an arête that ended into a loose slab section. The next place I could throw gear in was a good 20’ away, so I carefully climbed. Smearing my feet and slowly controlling my weight. I worked my way up until I found myself grabbing a bomber hold!! I quickly pulled myself up onto the infamous horn belay with a nice set of anchors. I set the belay, and Kari began to climb, cleaning gear as he went. As he popped out onto the loose slab section, he had the same impression as me: “What is this crap? !” Kari exclaimed! Kari joined me, as I sat straddling the horn, chilly, fully zipped up in my hoody. We had just 2 pitches left before the technical climbing was over. Although nervous, I was excited to take them on. The traverse was up next and after that the off width pitch. 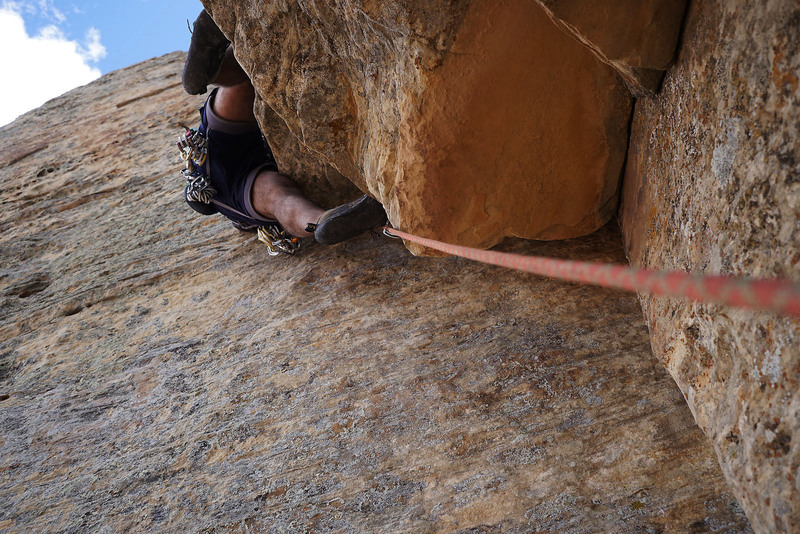 The traverse boasted almost no choices for protection and the offwidth pitch was some hard technical climbing. Kari but me on belay again . . . “Climb on!” he said. It wasn’t over yet! 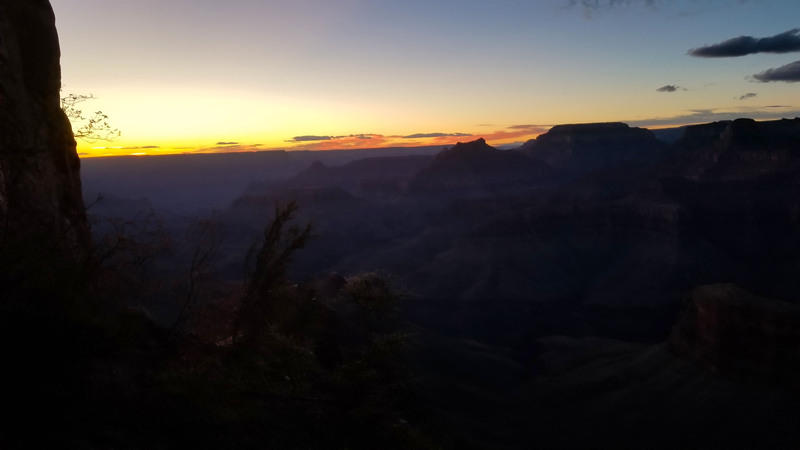 Kari and I pulled ourselves from the van, groggy and disoriented from the long drive the night before, the short sleep, and the frantic packing, before the bus came hissing to a stop just in front of the Bright Angel Lodge. We scrambled on board, and we were off! 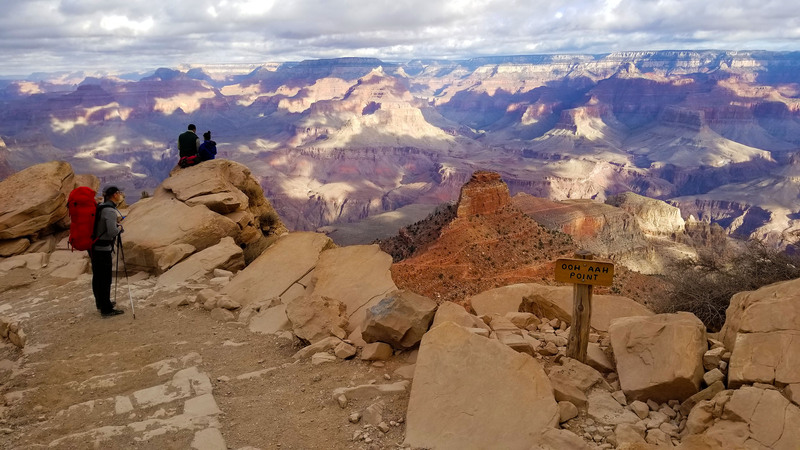 After the short bus ride to the trailhead we were finally feet on trail looking down South Kaibab trail and across the canyon to the base of the beast. Even from Ohh Ahh point Zoroaster stood proud and bold just tempting anyone to attempt a summit bid. We kept on trekking down towards the bottom of the canyon chatting with people and taking in the views as we went. Before we knew it, 8 miles later and 4500 ft of elevation drop, we found ourselves at the doorstop of Phantom Ranch. We threw our heavy packs onto the picnic tables and headed inside to grab some postcards to send home. After a quick rest we loaded up on the 5 liters of water that would last us through the night and the entire next day. What a beautiful sight, one of my favorite view of the GC! Well hello there old friend! 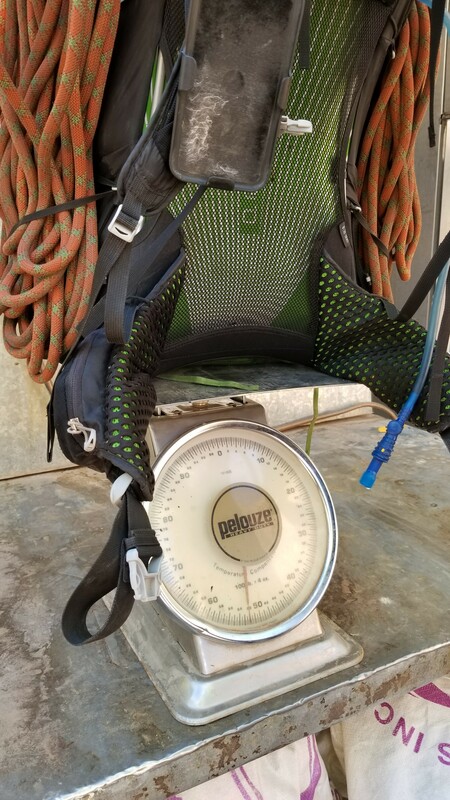 Our packs were heavier than ever, weighing in at a bolstering 53lbs each. The rope, trad rack, camping gear, food, clothes, and finally water was a tough but necessary in order to pull off our goal. We headed up the trail wincing at the weight as it cut into our shoulders. About ½ mile north of Phantom Ranch the Clear Creek trail took off right, east towards Sumner Wash where the “real adventure” began! 53 lbs? Think I need a diet! We pushed up and on as the two grueling miles gained 1500 feet towards the wash, Kari seemed un-phased by the weight. For some reason that day, it weighed heavy on me. I am not sure if I had met a weight limit that stunted my push, or if I hadn’t trained my legs enough, but I was definitely feeling it as we pressed on. 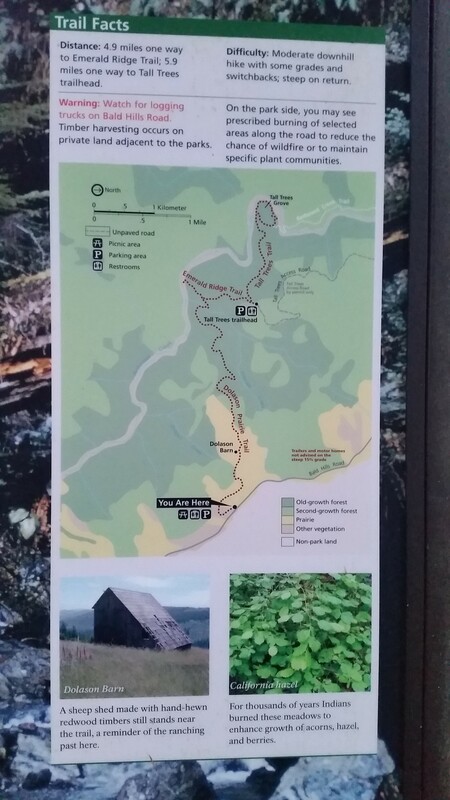 Finally we reached Sumner Wash and diverged from Clear Creek trail. We headed north for the Redwall Notch which gave us access to the Lower Supai Layer and Zoroaster’s arm. Turn the corner to finally see Zoro, standing proud as always! We grunted on finally reaching the base of the notch and threw packs down for a quick break. We each dropped a liter of water and stashed a little food in a tree to save weight. Soon we were on our feet again, racing against the sun, and heading out climbers right to a nice exposed class 4 climb that would circumvent a 5.7 technical climb (aint nobody got time for that!). We ascended carefully on the sharp rock, looking for the path of least resistance. Soon standing high over a sketchy down climb we looked at our options. There wasn’t much time for debate, so we de-packed and I down climbed as Kari got the packs ready to be handed down by rope. I can see the notch exit from here!! Soon after some questionable exposure we were both safe past the obstacle. We looked up the notch to see our next class 4 obstacle to navigate past. 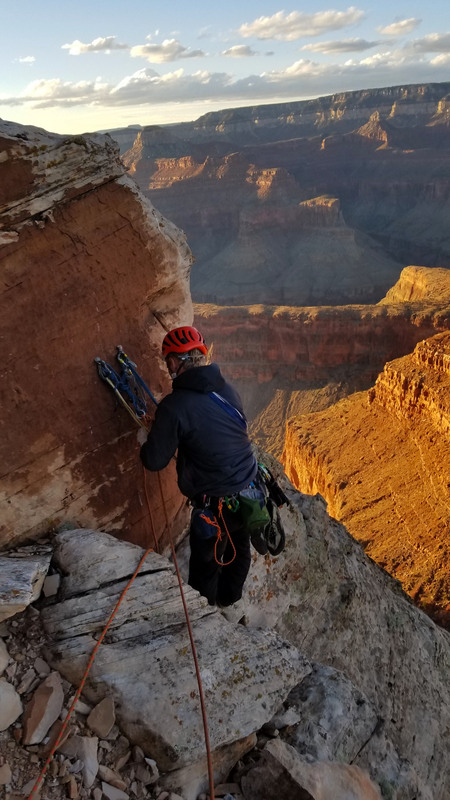 Sweaty palms, and labored backs, we carefully ascended a crack, going behind a short stubby bush, and finally taking an airy step across a death defying drop to safety. Whew! We both made it and were definite ready for safe ground. We continued up the class 3 notch towards the top out which was surprisingly tame. The sun set as we finished setting up and cooking food, an early bedtime was most definitely warranted! Finally we popped out and eyeballed a juniper tree with a large flat spot for a nice camp spot. We had made it safely to camp!!! I dropped my pack that had been cutting into my shoulders, with a gasp of relief! 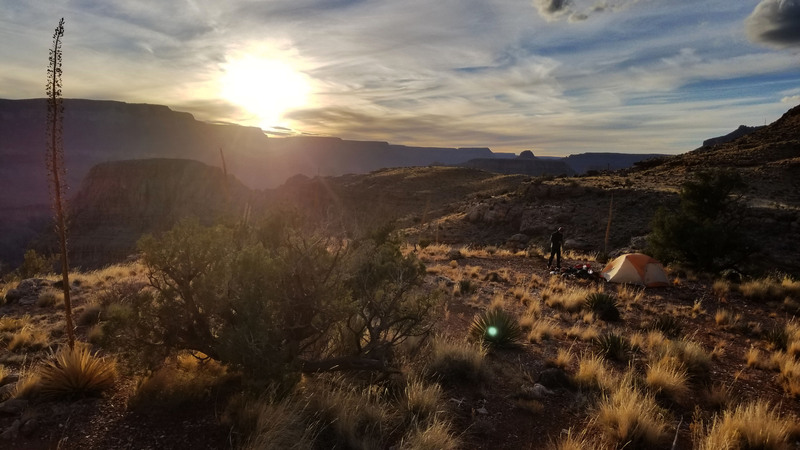 We began to set up the tent and looked south to enjoy the beautiful sunset over the Grand Canyon. Zoroaster stared down at us, and we stared back knowing the next day would hold some of the hardest trad climbing (well my limit at least) with no true promise of a summit in sight. Our work was cut out for us and we tucked into bed, trying to get as much rest as possible.